We’ve remade the rest, now let’s remake the best. QI is the British television show that America needs—and if there’s one thing we know about America, it’s if we need something, we take it. What’s So Special About QI? Most people know that America has imported scores of scripted British TV shows. Some, like The Office, Veep, and Three’s Company, which was based on the British comedy Man About the House, became great successes. Others—like the three shows that were meant to replicate the success of Fawlty Towers and the two attempts to recreate Absolutely Fabulous—sank ignominiously. Fewer people know that we also import British reality shows. These tend to be more reliably successful than their scripted counterparts. American Idol is based on the British show Pop Idol. Antiques Roadshow is a British import, and no one even bothered to change the name. Same with Whose Line is it Anyway? We love British television, and yet the best show of all time remains untouched. 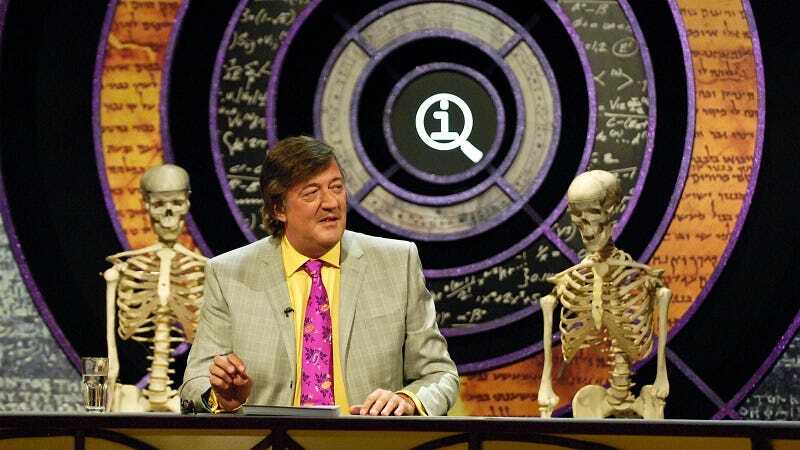 QI is short for Quite Interesting. It’s a “quiz” show, except that its quiz is impossible. Each question is either too cryptic to be understood, too abstruse to be guessed at, or a twist on a commonly-held belief that turns out to be wrong. When one of the panelists–usually three comedians and a special guest–guesses wrong in a conventional way, they get a heads up. They also get docked points, which is why a decent score is 0 and an excellent score is 4. Most people score squarely in the negative numbers. Since it’s almost impossible to get a question right, most panelists settle for dodging the forfeits by avoiding the expected answers to the questions, or bringing up little bits of trivia that they know. When the final answer is revealed, everyone discusses it a bit, and they move on. It doesn’t sound like much, but with the right combination of people, it’s pure magic. John Lloyd, the creator of the show, credits it with pulling him out of a depression, and I can perfectly see how it would. QI is silly, and it delights in being silly, but even more than that it delights in the wonderful weirdness of the world. How many words did Shakespeare invent? Why is there a tribe that speaks so much through sign language that they can’t talk in the dark? How many moons are there, anyway? Try to get through that without having an opinion on honey, bees, masonry, or every single person on the show. I dare you. QI is already popular among Americans. Plenty of the Americans I know watch pirated versions of the show, and whatever official clips the BBC allows. Every single one of them wants more. And yet what do we bring over? Wife Swap. The X Factor. Brat Camp. I know that America doesn’t have the best reputation in the world right now–but did we really deserve to get Brat Camp? In the US right now, both comedy and geek culture are taking off. I would say that it is the perfect time to start getting QI for the United States together, but actually the perfect time would have been a year and a half ago–so we could all be watching it now. Every year that goes by without a group of American nerds, comedians, and nerdy comedians all talking about obscure trivia is a year in which the world grows more culturally and comedically impoverished. It’s not like QI has kept itself strictly British. The Dutch have a version. Honestly, if it’s a question of copying the Netherlands when it comes to legal marijuana or copying them when it comes to QI, we should chose QI. You can grow your own pot. Growing five comedians and a host of fact-checkers is a great deal more difficult. Also, they require even more snacks.